So I got nominated. My first ever!! I graciously thank Evolving Yogi. *curtsies at ya* I don’t quite get yet what this nomination-thingy is, and I know there are several kinds. In time I’ll get to know them. What matters now is I’m nominated and I’ll bask in its glory!! 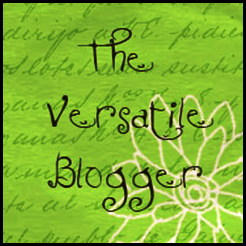 To the nominees, link here for the rules: The Versatile Blogger Award by Evolving Yogi. the study of the formation, meaning, and use of words. the study of the meanings of words and of idiomatic combinations. Ologies & -Isms. Copyright 2008 The Gale Group, Inc. All rights reserved. My nominees, through the time I have read their blogs, all depict their own form, functioning with the abundance they have, expressing their exuberance through their words and how life means to them. They can never be defined with only one word because they are on their own a mosaic of versatility. And for the finale, where by rule, I am to share some things about me… … I’ve got only one. And there is no other way to express this day than share our versatility together. Incidentally, it’s my 100th post! How cool is that??!!! And Happy Birthday fellow Virgo!!! Happy Birthday!!! Congratulations on your award as well, you more than anyone else deserves such an honor. The positive energy you put forth in your writing is both inspiring and touching, thank you! Feliz Cumpleanos! Happy happy birthday and thank you so much for the nomination. 😉 Lots of love from Mexico! Okaaayy… now I’m uber envious you are in Mexico! Happy birthday! And thank you! For a second there, I skimmed reading your reply and thought you’re sending an Italian… … … wouldn’t that be exciting??!! Keeping positive with the years ahead. It’s the only way to connect with miracles and magic. awww maia!! thank you so much sweet girl! happy birthday, mine was on the 8th 🙂 birds of a feather! you’re amazing and i thank you so much for such a lovely compliment! How have you been after the training? Teaching already?? Teaching friends is one of the best ways to acclimate yourself into being an instructor. Always ask for feedbacks. Also, attend other classes. You’ll notice that your view now is different compared when you were a student with no clue how to teach yoga. You’ll notice certain phrases, cues, and teaching styles that you may like. The beauty of yoga is that tho there are ‘sort of’ patented practices, we share what we know and we can take what we can. Envious!! Would love to go through the whole ashtanga series! There’s always ongoing classes in the city, but it is hard to travel back n forth for it. Plus gas. Plus the time since it’s broken down throughout the year. I feel you’ll love it. And may end up going through it. The beauty of ashtanga is that it builds strength to develop yourself in transitioning to the series. I find it very deep and soulful as one practices their own pace. My training is Ashtanga-Iyengar. And it would be wonderful to dive into it more. That’s exactly what I love about it! Practicing with my breath! It’s exhilarating!